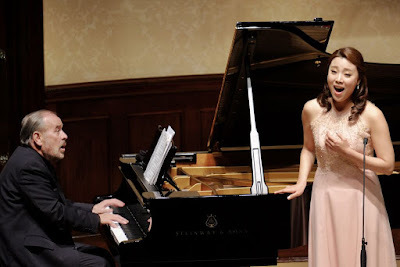 The young Korean soprano Sumi Hwang and veteran Viennese pianist Helmut Deutsch gave a programme of mostly Lieder at the Wigmore Hall in the third Rosenblatt Recital of the season. Their programme mixed Lieder by Schubert, Rachmaninoff, Berg and Strauss with operatic arias by Puccini and Massenet. They started the evening with Schubert's 'Ganymed'. 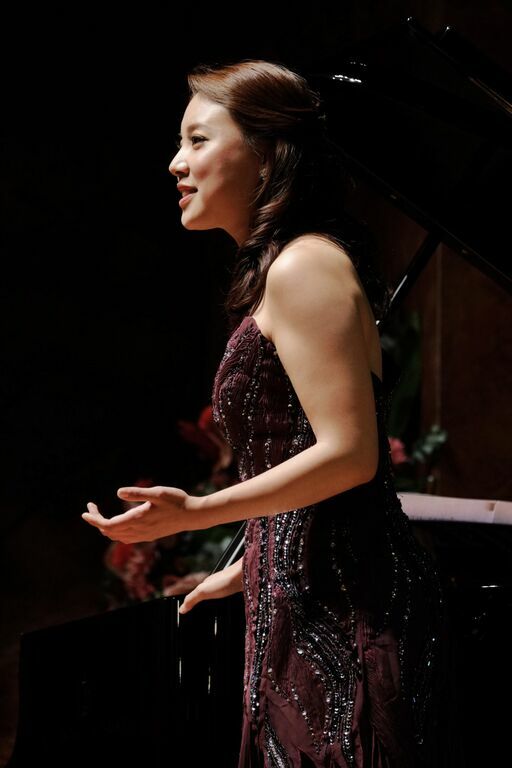 Hwang demonstrated a bright, attractive voice and solid technique, sailing effortlessly through the treacherous final phrase Alliebender Vater with gallons of breath to spare, while Deutsch provided a rich and characterful grounding on the piano. The remaining items in the Schubert set were all settings of Goethe poems but they did not match the early promise. Hwang didn't not convince us she had explored the complexity and darkness of the texts, and her German diction was at best approximate, at worst lacking vital consonants. The Wigmore Hall audiences are changing, but they would expect to hear the words in standards like 'Gretchen'. The most successful of the Schubert songs was in her first encore 'Seligkeit', which was eminently suited to her sunny, candid stage presence. And it left us wondering why she didn't do more like that to show off the voice and set the scene. The Rachmaninoff set included 'Ne poy, krasavitsa, pri mn'e' – Songs of Georgia – and 'Vesennie Vody' – Spring waters. Evocative virtuoso playing from Deutsch, and Hwang was beginning by the interval to relax and give us a little more three-dimensional singing to match. The second half started with Berg's 'Seven early songs' – technically excellent, though again the Viennese ambiguity and neuroticism were provided by the piano rather than thanks to her treatment of the text. By far the highlight of the evening was the set of five Strauss songs (plus 'Zueignung' for the second encore): 'Nichts', 'Die Nacht', a gorgeous and atmospheric 'Wiegenlied', a poignant 'Morgen!' and ending with a spectacular 'Cäcilie'. By now Hwang had found her feet and she and Deutsch were working as a stylish duo. Puzzlingly, two opera arias were 'interleaved' in the programme: 'Mi chiamano Mimì and 'Adieu, notre petite table'. Hwang's opera credits include Mozart, Donizetti and Ravel. She has performed Puccini's Liù but no Massenet. The arias sat uncomfortably in the programme, neither of them played to Hwang's strengths and both exposed her poor diction. The third encore was an arrangement of 'Amazing Grace', in English and Korean and camped up amusingly by Deutsch on the piano. It was an enjoyable evening. Hwang has an engaging presence in the right repertoire and a lovely voice that was, as expected, stylishly supported by Deutsch. But Hwang needs to think about her choice of repertoire, matching it to her voice and stage persona and also to her audience. Above all, though, she needs a language coach. She sang in six languages and five of them (I couldn't comment on her Korean) were in need of work in order to make us believe she was really living the songs.